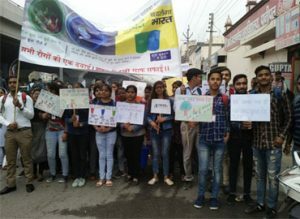 As part of the ongoing Information, Education and Awareness activities in the Sonepat-Panipat cluster in Haryana on behalf of JBM Group, around 230 students were triggered on Solid Waste Management (SWM) at Arya PG College, Panipat on 12th March, 2019. Feedback Foundation team sensitized the students and teachers on the growing issue of municipal solid waste and various methods of managing waste. Students were motivated to reduce impact on environment by reducing waste at source. Triggering was followed by a swachhata rally for sensitizing citizens about at-source segregation of waste, using separate bins for wet, dry and hazardous waste, and importance of waste management.The rally was flagged off by Chief Guest, Ms. Avneet Kaur, Mayor of Panipat Municipal Corporation.